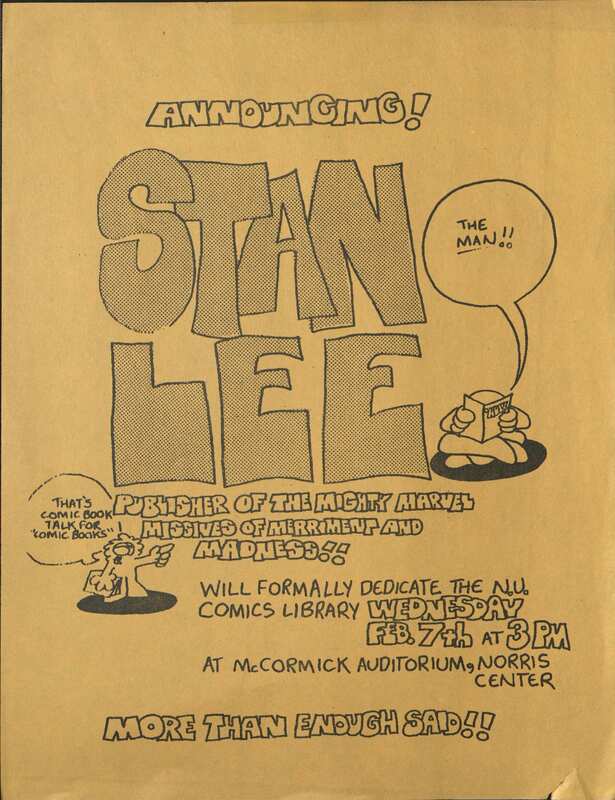 At the news of the passing of legendary comics creator Stan Lee, we looked back at the day the Marvel publisher visited Northwestern University to dedicate a brand new comics collection now held by our own Charles Deering McCormick Library of Special Collections. On Feb. 7, 1973, a crowd of about 250 gathered in McCormick Auditorium to hear “the high guru of picturebooks,” as the Daily Northwestern called him, speak about the shift of comic books from kid’s stuff to satisfying entertainment for grownups. Lee played a significant role in changing that perception, through dint of his irrepressible creativity, prodigious output, and penchant for inserting four-color heroes in real-world situations. 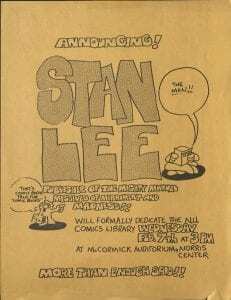 The 1,000 Marvel comics dedicated by Lee that day were donated by Northwestern student Juan Cole ’75. 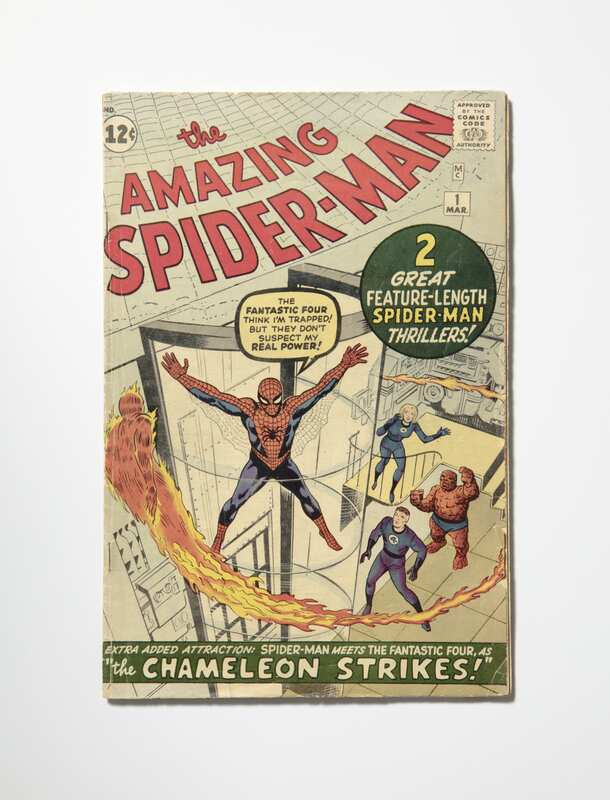 The collection contains many rare finds, including the first issue of “The Amazing Spider-Man” from March 1963, the first Marvel comic devoted to the now-wildly-popular web-slinging hero, written by Lee and drawn by Steve Ditko. After McCormick Library curator Russell Maylone accepted Cole’s donation, fellow student Walter “Wally” Podrazik ’74, wrote to Lee, and invited him to an official dedication ceremony. Lee, who usually commanded substantial speaking fees, agreed to fly in for free to speak. 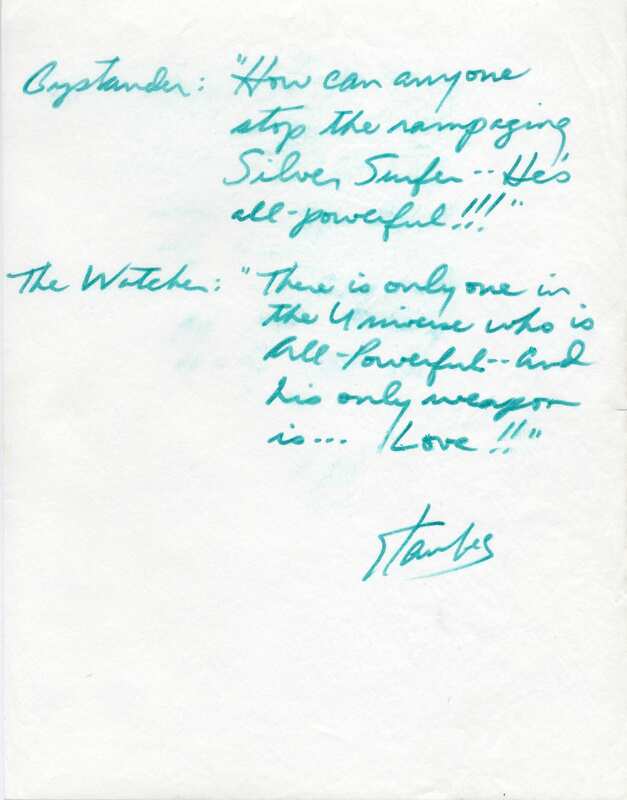 A vignette (between a bystander and The Watcher) written and signed by Stan Lee during his visit to Northwestern in 1973. Thanks to donations by more fans of funnybooks, the McCormick comics collection has since grown to thousands of issues dating back to the early 1930s. The library also holds many comics precursors such as illustrated “Big Little Books” (Whitman Publishing Company) that drew their subjects from radio programs and newspaper comics, as well as dime novels. These collections are open for research use and available for anyone to view.